Some useful announcements for you guys this Saturday. Here's the first and I think it's something most parents like me will greatly appreciate. It's Back To School Season once again and for some reason, schools always raise their tuition every year :S (ugh!) Aside from that, it also means that we will have to spend a small fortune soon for our kids back to school essentials. The list can get pretty long...schoolbags, lunch kits, school shoes, underwear, socks, camisons, p.e. shoes, etc. Just thinking about it gets me tired already. 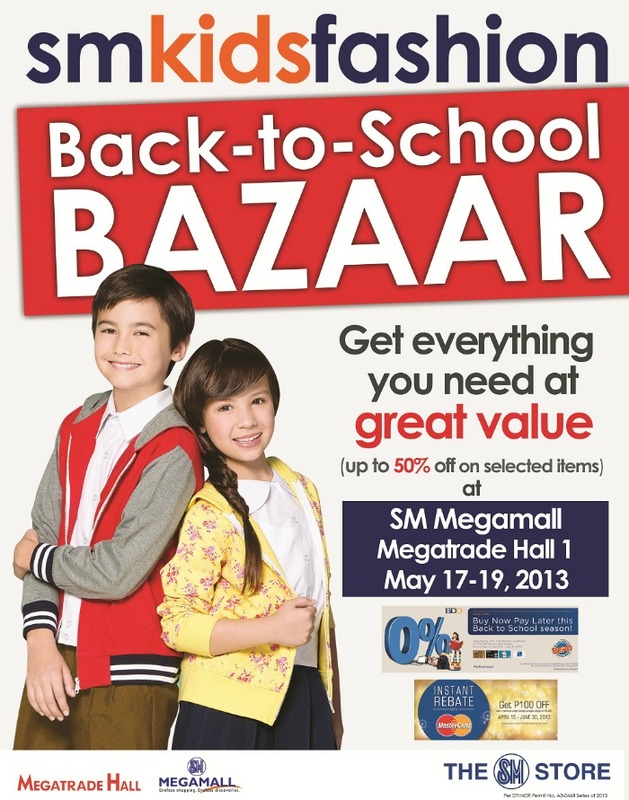 If you want to save some money on this and would like to get the fun back into shopping, join me at the SM Kids Fashion Back To School Bazaar this May17-19, 2013 at the Megatrade Hall 1 of SM Megamall. They have everything under one roof and I'm hoping to get all my shopping done in one day. Aside from big discounts (50%off!!! ), you can also avail of 0% interest on installment payments for every P3,000 minimum purchase on selected credit cards from May 16-19, 2013 or you can even Buy Now and Pay Later with BDO Credit Cards (great for recovering the monthly budget!). And lastly, visitors can also cut P100 off every purchase with Mastercard's instant rebate program from April - June 30, 2013. So there you go mommies and daddies! Hope this helps you pinch a few pennies this super gastos season! Don't forget to save the dates! May15-19, 2013 at the Megatrade Hall.